Take my life, take my land, take my funding if you can. I don’t care, I’m still free; you can’t take the orbital space station from me. Okay, that’s where the song breaks down. But we’ve got a shirt to talk about. I can’t just sit here trying to think of more words for this NASA/Firefly mashup parody song. If you’re a fan of space at all, chances are you’re a fan of both of these things, so it’s a good bet that this shirt is for you. Unfortunately, it doesn’t actually “shine,” per se, but you’ll “shine” with happiness if you wear it! And isn’t shiny really just a matter of perspective? 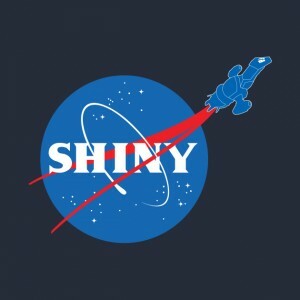 But, look, the point is that NASA and Firefly are a perfect mashup because NASA just keeps on going despite the hardships of funding loss just like the Serenity keeps on flying. So wrap this shirt around your torso and declare to your friends that nothing’s going to stand in your way. You’re still free.